You can make any cake a rainbow cake – you just need a basic white or yellow cake, lots of bowls, a little patience, and the colours of the rainbow. A happy disposition is recommended (but optional). Toronto is a remarkable city. If you haven’t been to visit, let me tell you, the things you hear about it are true – it’s clean, it’s safe, people are polite. It is such a welcoming city, too – no matter the colour of your skin, no matter your religion (or lack thereof), no matter your ethnicity or sexual orientation, Torontonians accept you for who you are. In fact, we celebrate our diversity, it’s what makes our city unique. And this is most apparent during Pride Week. Pride used to be just about LGBTQ (and it still is) but it’s evolved to become even more inclusive. And it culminates in a Pride Parade where a million people are out on the streets, just being themselves, having a grand time. This year though, they’ve decided to make it Pride Month, starting today. And what better way to kick off celebrations than with cake? (Cake is always the answer). And what better cake to celebrate with than a rainbow cake? 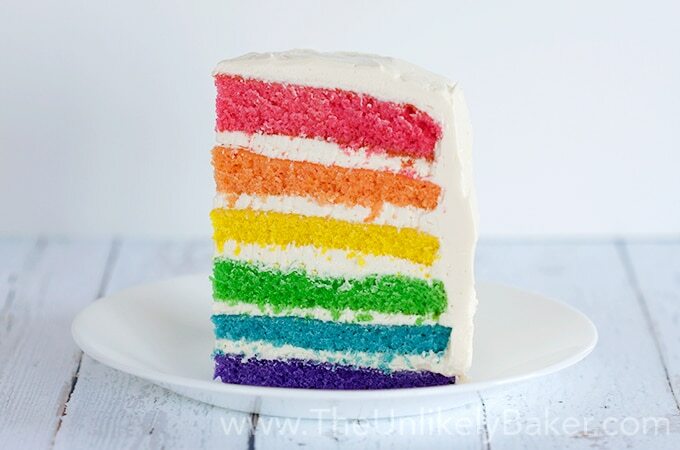 A rainbow cake looks intimidating (6 layers!) but it’s really just your favourite white or yellow cake (in my case, I used my favourite vanilla cake) that’s divided into 6 layers and tinted the colours of the rainbow. It takes time and patience but the end result is worth it. Since this is going to be a 6-layer cake, the cake you pick has to be dense. Stay away from the soft and too moist cakes because after the 4th layer, your cake might not be able to support any more and either sink, sag or just collapse. Pick a cake that has enough batter to be divided into 6. You want layers, not pancakes.
. You can eyeball it but do you really want to take the chance and end up with uneven layers? A kitchen scale is very useful here. You can get one for less than $20. 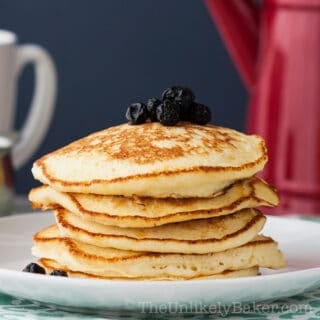 When dividing your batter, remember that there will be residue batter left on the bowl or the cup you’re using to transfer or the spatula you’re using to scrape. So if you have a total batter of 1300g / 6 = 216.67, don’t transfer exactly 216.67 to each bowl because you won’t have enough for your last one. Transfer a gram or two under to account for rogue batter. If you don’t have enough pans, don’t be tempted to use different sizes and plop them into the oven all at once. And you can’t let the batter sit in the bowl waiting for the first batch to bake because the ingredients are reacting to one another more than they should. You’d need to divide the recipe and make only enough for the pans you have (i.e. if you only have 2 8-inch pans, you will have to divide the recipe into 3 so you’ll make it 3 times).
. The liquid kind just won’t be vibrant enough and you’ll need to use a lot, which will put too much unnecessary liquid into your batter. Once your cakes are baked, trim the top as well as the sides. Not only to ensure they are even, but also to ensure you get the burnt/brown spots out of there. Now what to frost your cake with. I say pick your favourite frosting and go with it! 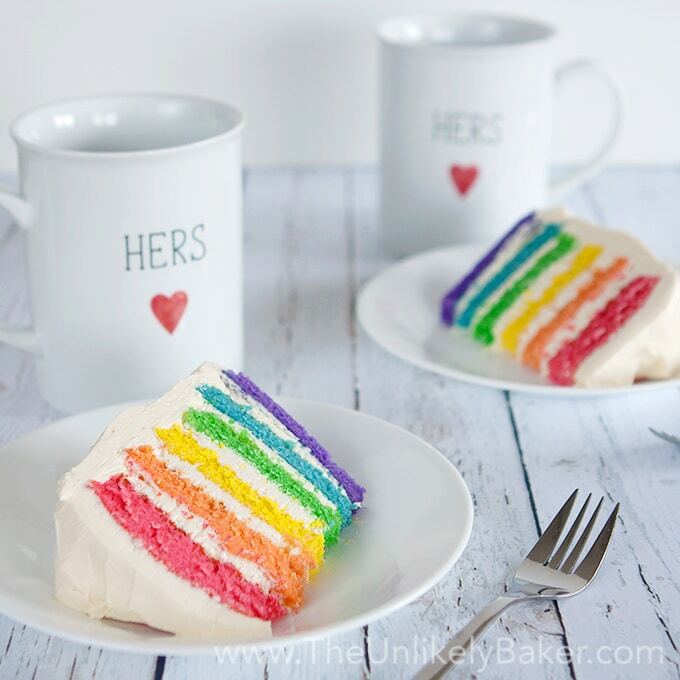 White is always stunning with the rainbow colours but hey, it’s your rainbow cake and it’s all about celebrating who you are and what makes you happy. Just make sure you have enough frosting to frost between and all over your cake. 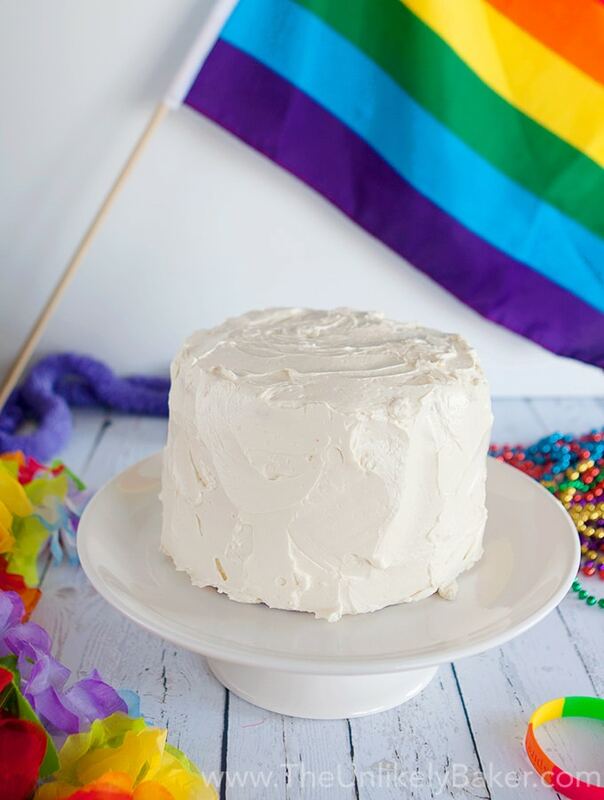 In my case, I used my go-to Swiss Meringue Buttercream and it went perfectly with my vanilla rainbow cake. It was delicious. I know it looks like a lot of work but when you get into it, it’s really not that difficult. And the moment you cut into the cake and your exquisite layers look right back at you – take a moment and pat yourself in the back. Well done you. So do your planning, bake this cake and wow your guests, birthday celebrant, yourself. 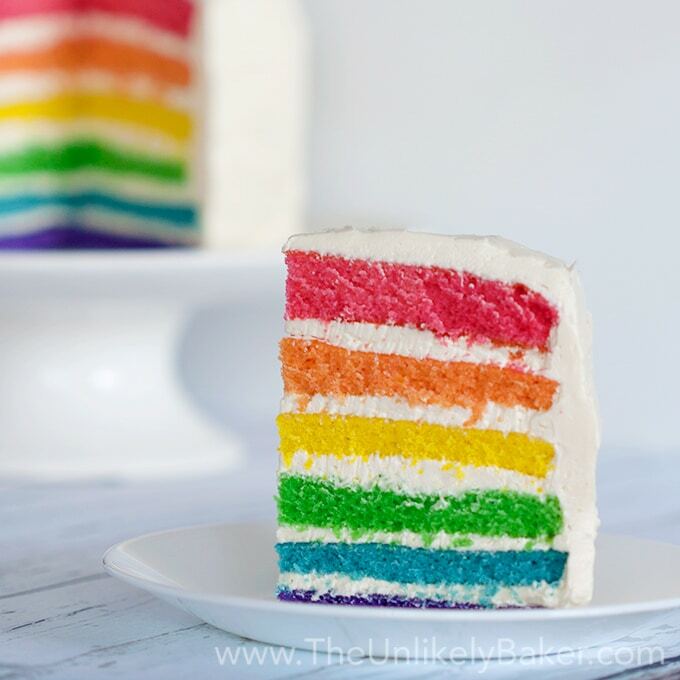 You can make any cake a rainbow cake – you just need a basic white or yellow cake, lots of bowls, a little patience, and the colours of the rainbow. Preheat oven to 350F and grease the sides and the bottoms of 6 8-inch pans (see my tips on what to do when you don't have 6 pans). Line the bottom with parchment paper for easy release. Set aside. In a medium bowl, combine 3 cups flour, 1 tablespoon baking powder and 1/2 teaspoon salt. Set aside. 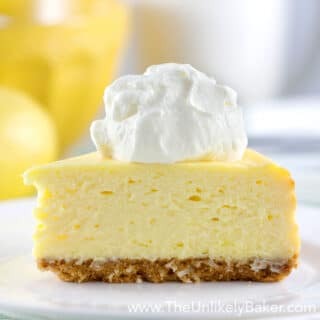 Using a handheld electric mixer or a stand mixer fitted with the paddle attachment, beat the 4 eggs, 2 cups sugar and 1 tablespoon vanilla until light and triple in volume (about 10 minutes). Start on low speed then gradually move up to medium-high speed. Drizzle the 3/4 cup canola oil while beating. Switch to low speed and add a third of your flour then half your milk. Another third of your flour, the rest of your milk and finally the rest of your flour. Make sure each addition is incorporated well. Beat the batter until smooth (about 5 minutes). Weigh your batter and divide the total weight into 6. Transfer the corresponding weight into separate bowls (see my tips on how to correctly divide and transfer the batter). Tint each bowl in red, orange, yellow, green, blue and purple. Then transfer into prepared pans and bake for 20 minutes (see notes) or until a toothpick inserted in the middle comes out clean or with minimal crumbs. Let cool in the pans for 10 minutes before transferring to a rack to cool completely. Trim the tops of the cake to ensure they are level. Also trim the sides to remove any burnt spots. The important thing to remember is all your cakes must be of equal width and height. Put the purple cake on a cake turntable first and evenly spread frosting on top. Do the same for the blue, green, yellow, orange and red layers. Then proceed to cover the rest of the cake with frosting and decorate as desired. You can also use 6 6-inch pans. Just remember that you will end up with a smaller width cake but thicker layers, and therefore a taller cake. If you have 6 pans, they won't all fit on the middle oven rack position. So at 10 minutes, switch the bottom pans with the top pans for an even bake. You can cook the cakes the day before and make the frosting the day you're serving the cake. Just leave the cakes on the counter and loosely cover with a tea towel. You'll notice that my red layer is more pink/coral than red. I used the red gel colour but it turned pink. Any tips? (Vanilla cake recipe adapted from Ricardo). Did you make this rainbow cake? Tell me about it in the comments section below. I’d love to hear all about it. Want another fun cake? Check out this Funfetti Cake. I’ve noticed that when using darker food colorings it’s easier to add the color to the butter before mixing everything. But for a cake like this I would suggest using a more concentrated/deeper shade of red. Adding it to the butter is an interesting idea. I’ve never tried it…will it change the chemistry of the butter (e.g. the way it reacts to sugar when creaming) in any way? Thanks for the recipe, I’m making it for my youngest child’s 3rd birthday. I think with red food coloring, even the gel, you just have to use way more than you really want to or think necessary. 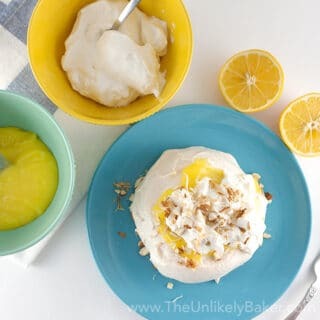 You might also consider using a white cake as the base recipe rather than yellow, the yellow from the egg yolks might have an impact on the final colors. Hi Sarah! I was just talking to my local baking supplies store about red food colour last Saturday! I was telling them how I cannot for the life of me get anything to turn Christmas red (who wants to receive fuchsia Christmas cookies LOL!). They explained that with butter based anything, it is almost impossible so using a white cake is a smart move. They did recommend I try using powdered food colour next time instead of gel. I haven’t tried yet though. Have you? PS: Happy birthday to your little one! 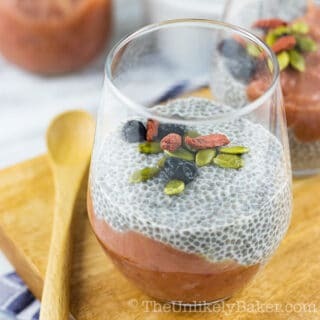 This looks gorgeous and i’m hoping to give it a go as I need to make an Olympic themed ‘showstopper’ for a work bakeoff. 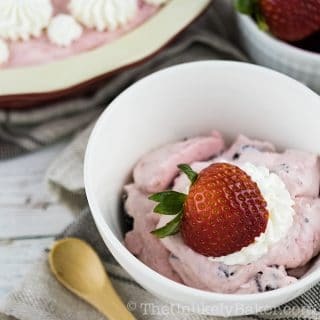 I want to keep things simple and stick with your swiss mergingue buttercream – do you have a sense of how many batches of that I would need to make in order to assemble and cover the cake? Also – I plan to bake on Sunday and hopefully assemble on Monday – will it hold up to take into work on a Tuesday? I assume so but not sure if the color from the cakes bleeds at all or how well the frosting will hold up? Hi Meg! I used Swiss Meringue Buttercream here too. 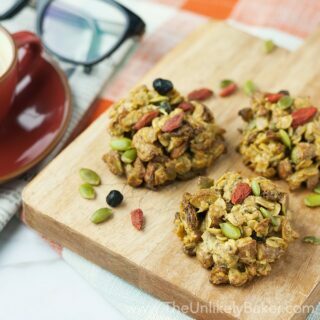 I have a recipe on my blog and that yields about 4 cups and it was enough. I didn’t do any sort of decoration though, just the layers, the crumb coat and the final coat so if you’re thinking of doing like flowers on top or on the sides, you may need to do 1.5 of the frosting recipe. Are you planning to make the buttercream the day you assemble it? That would be my suggestion. And yes the cake should stay in place. You can put it in the fridge once it’s frosted if you like and just keep at room temp about 20 mins before you’re serving it. The colours of the cake here don’t bleed even days after assembly. I used gel food colour. Good luck with the bake off!! Hi Dylan! Thank you 🙂 I on the other hand should really have more layered smoothies haha! Hope you’re having a wonderful weekend! That is a beautiful, well done rainbow cake! Very nice! It looks so delicious! I feel like putting my hands inside my laptop and grabbing it right now! Have pinned it for my reference. What a beautiful cake! The colors are just stunning. My daughter would love this for her next birthday. this is so cool! 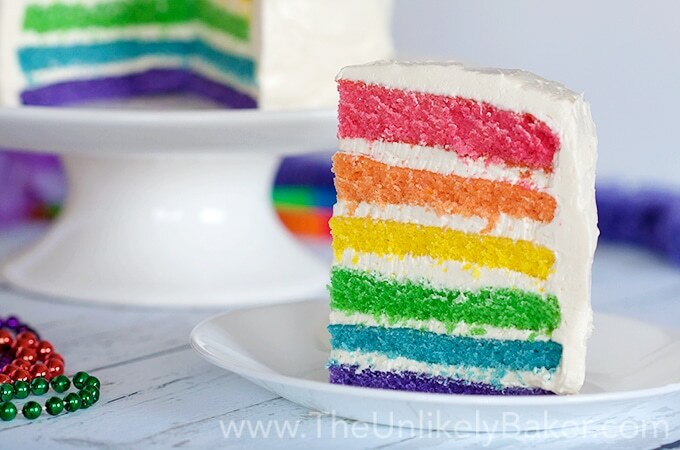 I have not seen the rainbow cake before and I think it is utterly great! thank you for sharing this! Happy to hear that 🙂 You are most welcome Helena! Very nice! I love the way you’ve really made rainbow cake accessible and do-able, instead of just posting a bunch of (admittedly gorgeous) cake photos. gorgeous! and thanks for those tips! I’ve always wanted to try it, but I’ve never done any layer cakes! I must admit layer cakes can really be daunting but organization is key to a stress-free kitchen 🙂 Hope you give it a shot! Hi Gemima! Thanks for pinning! And your sister is very lucky – she is about to receive a really awesome birthday cake 🙂 Let me know how it goes! This cake just looks absolutely perfect! I’m sure it’s harder than you made it sound but can’t wait to try. Thanks Sophie! I promise it’s not difficult, just more steps than your usual cake 🙂 So planning ahead is really key here. Hope you give it a shot! I love this idea! So cute – I think I would do an ombre version! An ombre version would look gorgeous! You must share a picture of the final product! 🙂 Can’t wait to see. Thanks Chloe! I had the fortune of staying in Toronto for a over a month and fell in love with it. It is a very inclusive and embracing city and wish I could live there long term! Hi Agatha! I do feel homesick a lot but living in Toronto helps counter that – it really is a lovely city 🙂 Winter I don’t care for so much (ha ha) but the summers are just stunning. Happy Pride Month! What a beautiful way to celebrate, this cake is GORGEOUS. I love your tips – I never thought of measuring them out so they weigh slightly less to account for the extra batter, brilliant! Happy Pride! When I saw your cake, I didn’t even think of a rainbow cake for that reason, but it is so fitting. I love the vibrant colours of your cake. Nice to know it isn’t as hard as one would think to make. Hi Janet! Happy Pride! I was surprised too. It wasn’t as difficult as I expected; just more steps than usual 🙂 Hope you get to try making one sometime. Your tips are valuable. It’s been a long time I wanted to make rainbow cake but I don’t really dare to make it because all those layers. Thanks for sharing the tips. This is so fun and would put a smile on anyone’s face! Great tips on how to make it too. Thanks for sharing! Doesn’t it? It’s just so colourful and bright and happy 🙂 Thanks for passing by! Pinned for later. This is just so so so cool! I love this cake! It is soooo beautiful! The colors look so vibrant and the layers are very even. You did an amazing job! I’m happy to hear that Toronto is such clean and friendly city 🙂 I cannot wait to see it for myself in a bit over a month! Thanks Natanja! You’re an awesome baker and you bake stunning cakes so I really appreciate it 🙂 And yes, I’m excited for your trip! Wee! Yum!! Love how all of the colors came out really bright! This is a beautiful cake! I love the colors and concept. Stunning! I love the way this cake looks! Tanks for all the tips and tricks. I bet it tastes as good as it looks. The pride cake is amazing but your photos are off the chart. Great job with this post. I couldn’t wait to read and see more. Mmmmm-mmmmm-mmmmm!!!! I think I’ve just found my next birthday cake as your rainbow cake looks amazing!!!! And great instructions too so it looks do-able! And I have a month to practice….now then, where’s my apron….?!! Great post, thanks for sharing! These are so pretty! I love how in the pictures. You show Hers and Hers mugs! My wife and I have thought about moving to Canada. The U.S. is getting more and more scary. Violence is getting way out of hand here. Maybe once it was a great nation. But now it is more like the ghetto side of town that you avoid…. Thanks very much JT! I got those mugs at a huge discount too 🙂 Sorry to hear about the violence. Toronto has crime too don’t get me wrong – I guess there’s crime anywhere. We all just really need to be smart and careful these days eh? It’s not the world our parents grew up in that’s for sure. I bet this tastes like happiness. Keep up the good work!! AW Happy Pride and I love that Toronto is so welcoming and inclusive rather than exclusive. The cake is amazing! Thanks Ana! There are some bad apples as with any city but generally people are nice and welcoming 🙂 Happy Pride! Such an amazing idea ! These all colours and the whole idea is great! What a stunning cake. My children would LOVE it! 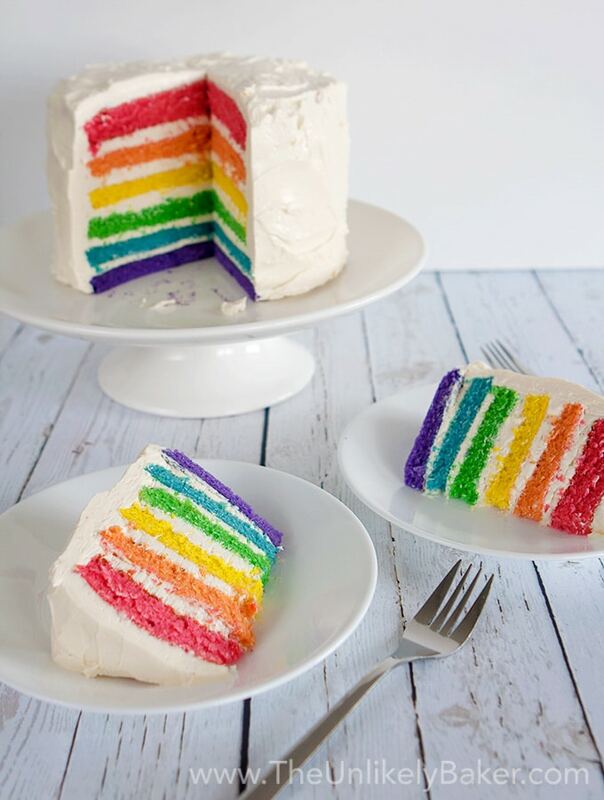 I am hoping that my husband will make me a rainbow cake for my birthday – they look beautiful. Drop a major HINT HINT 🙂 Hope you get your wish! Thanks Dannii! Oh my gosh this is so amazing! I would love to attempt this! Unfortunately, I lack the patience needed to make this! Haha. Perhaps on a special occasion I could muster up the patience to make such a beautiful cake! Thanks for sharing! My best friend will love this! I’ll makes it for her birthday. Great job! Looks amazing! Keep it up! Jolina you’re killing me – all I can think about is combining this rainbow cake with your funfetti cake! OMG the colors and the sprinkles together! I could die! Love love love. I loved Toronto when I visited two years ago – I’d love to return. This cake looks absolutely amazing. I love the look of rainbow cakes but hardly ever use food colouring. Swiss buttercream is my favourite too. No idea how to make it red but it looks perfect! Rainbow cake is on my to do list forever. I love Toronto beautiful city and foodies heaven. You make this look so easy!! Your cake making skills are definitely something I aspire to – I’m FAR from making any layered cake in general! This is simply gorgeous! What a great way to celebrate Pride month! That cake is gorgeous! Happy Pride! This is a lovely way to celebrate 🙂 Those rainbow layers are just perfect. Seriously, so, so gorgeous. I need an excuse to make a rainbow cake now!